The various structures in your mouth — your teeth and gums, of course, as well as periodontal tissues that hold teeth in place within the jaw — all function together to create your smile. This includes muscles like the frenum, a fold of muscle tissue that connects the gums to the upper lip, which helps pull the lip upward when you smile. Unfortunately, an overly large frenum could contribute to an unattractive space between your two upper front teeth. The problem occurs when the frenum grows beyond its normal range and runs between the front teeth to connect with the gums behind them at the forefront of the roof of your mouth. The resulting space that may develop can be closed with orthodontics, but unless the excess frenum tissue is addressed the space may eventually reopen. The frenum is just one cause among many for a noticeably wide space, including bite problems (malocclusions), finger-sucking habits or missing teeth. We would, therefore, need to examine your mouth to determine the exact cause before beginning any treatment. If indeed the frenum is the source of the problem, it will be necessary to ultimately remove the excess portion through a procedure known as a frenectomy. A frenectomy is a minor surgical procedure performed by a periodontist, oral surgeon or a general dentist with surgical training. After numbing the area with local anesthesia, the tissue behind the teeth is dissected or reduced in size with a small scalpel or a surgical laser. The wound is then closed with a few stitches; any post-surgical discomfort is usually minimal and managed with non-steroidal anti-inflammatory pain medication. The wound will completely heal within a few weeks. Most frenectomies are performed after orthodontics to close the space. 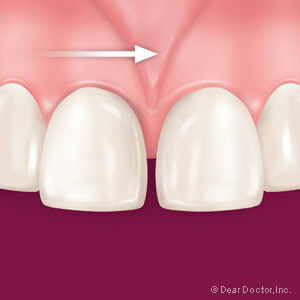 Removing it prior to tooth movement may result in scar tissue that prevents the space from closing. It’s also easier for the surgeon to gauge how much tissue to remove after space closure to avoid removing too much, which can leave a “black” triangular hole where gum tissue should normally be. Treating an abnormally large frenum isn’t difficult, but it needs to be coordinated with orthodontic treatment for the best outcome. The end result is a smile that’s both healthy and attractive.